The “Tiny House” movement is gaining popularity throughout the United States and is pushing the boundaries of what we believe to be “minimalistic”. Some homeowners are shifting from large, luxurious houses to a smaller, convenient livable spaces. The average American house is 2,600 square feet, while a tiny house is considered any home less than 400 square feet. Whether in a permanent location or on the move, tiny homes are popping up across the United States. They are unique homes that require thoughtful planning and construction to be efficient with such a minimal amount of space. Extreme downsizing means it is critical to choose the right materials to create a durable, energy efficient, and effective tiny home. 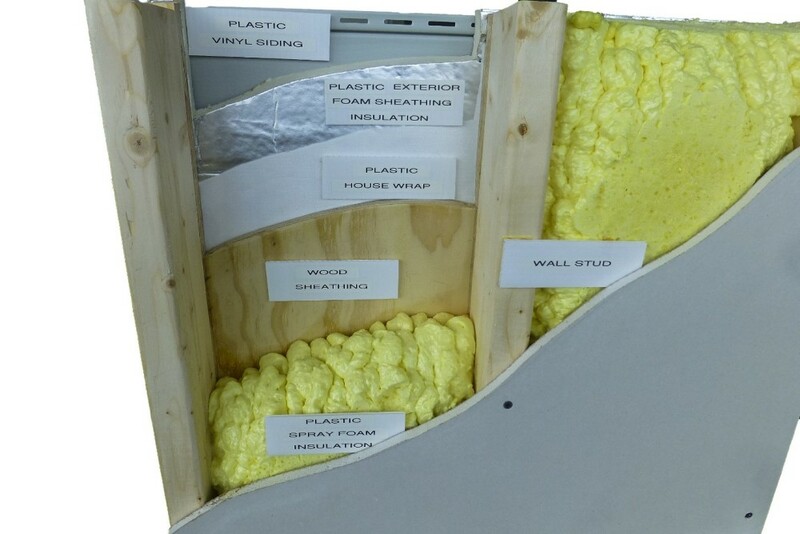 When selecting insulation materials for tiny home construction, there are two important factors that must be balanced: maximizing energy efficiency while minimizing the wall thickness and cavity of the insulation. Every square foot in a tiny home counts, and spray polyurethane foam (SPF) is especially well suited to maximize space by minimizing the amount of insulation needed to keep the tiny home comfortable all year. SPF offers one of the highest R-values per inch, helping builders to meet local code requirements using less material and constructing thinner walls and insulating cathedral ceilings. Conventionally-sized homes have benefited from the unique attributes of SPF for years. SPF is durable, extremely energy efficient, and is applied on site to adhere to almost any shaped substrate. These same properties make SPF a preferred choice for tiny homes because, with a single product, SPF can remain effective while taking up less space than traditional insulation. In 2015, Plastics Make It Possible® and Zack Giffin, co-host of the FYI Network’s “Tiny House Nation,” worked together to create an energy efficient tiny house using innovative plastic products that included SPF insulation. That tiny house shows how modern architecture and building materials can improve efficiency and save energy – all while saving space. Because SPF conforms to the substrate and fills nooks and crannies in a home’s structure, the tiny house demonstrates minimal air leaks, excellent thermal performance, and the ability to maintain a comfortable temperature within the small space of the home. In addition to SPF’s benefits during the construction process, the use of SPF has been found to help reduce potential impacts to the environment. According to a published Life Cycle Assessment, installing SPF can save the equivalent greenhouse gases created during the manufacturing process through energy savings in less than six months in some environments. Those looking for a minimalist lifestyle should consider SPF the smart choice to save space and maximize energy efficiency when selecting insulation for their new tiny home! For more information, check out www.whysprayfoam.org.